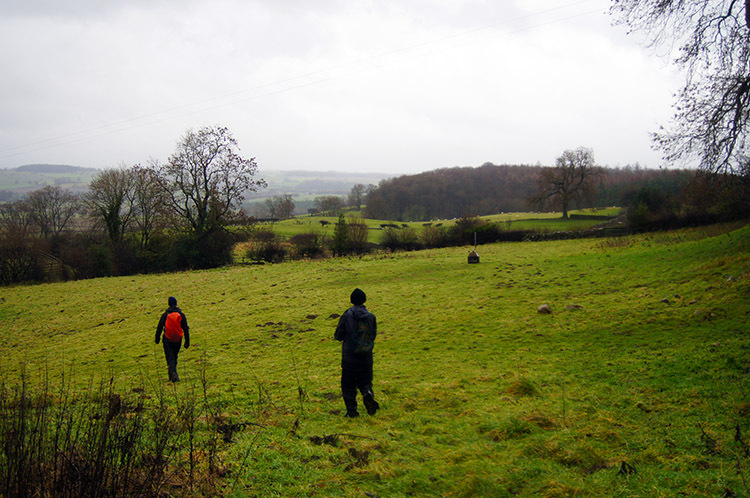 Summary: A good walk in the countryside of mid Wensleydale. 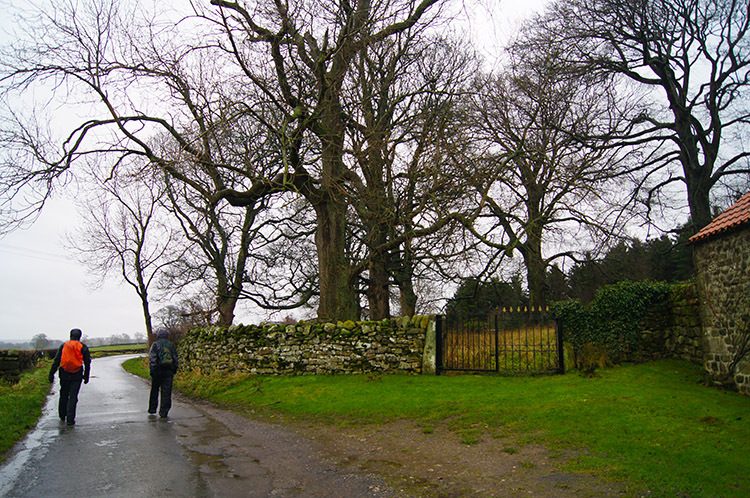 Starting from East Witton the path follows country lanes, forest tracks and across fields to Jervaulx Abbey. After the abbey most of the walk is along the bank of the River Ure to Cover Bridge before climbing back from river level back to East Witton. The Walk: Every time I look at walks in this area I wonder. There is not even a River Wensley, it is Wensley Brook which runs into the village of Wensley so how the widest and probably the most well known of all the Yorkshire Dales is named Wensleydale and not Uredale as the home dale of the River Ure is a mystery to me. 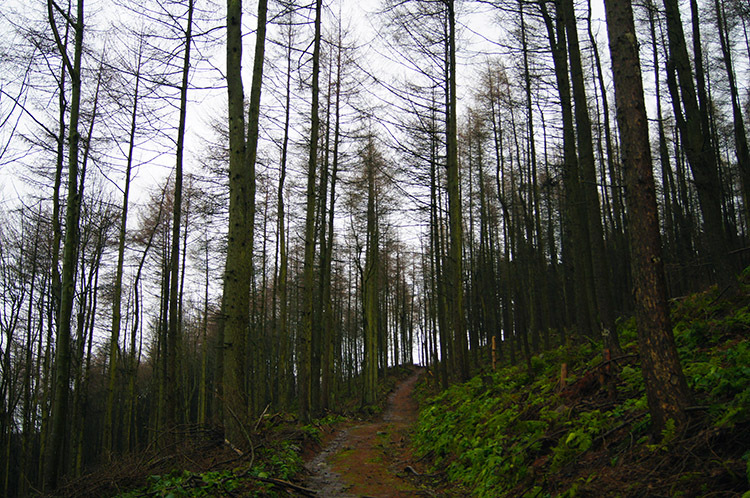 In fact the previous name was Yoredale named after the the Yoredale Series of geological strata in the area. Oh, the mystery deepens. Let's go for a walk shall we? 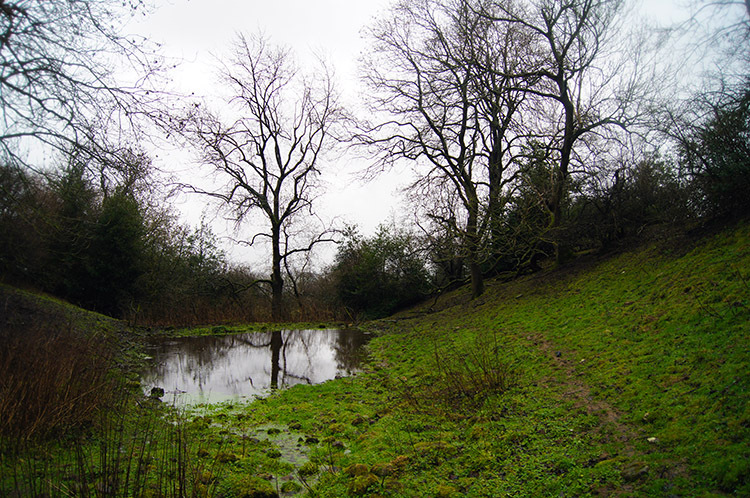 For the last walk of 2013 I chose to design a walk around Jervaulx Abbey, the Cistercian ruin which had always eluded me. Not any more, I would soon unveil the hidden charm of the place as I set out from East Witton in the company of Dave and John. Despite the miserable weather we were not going to let the elements beat us, Christmas had taken its toll and we needed to get out for a walk. 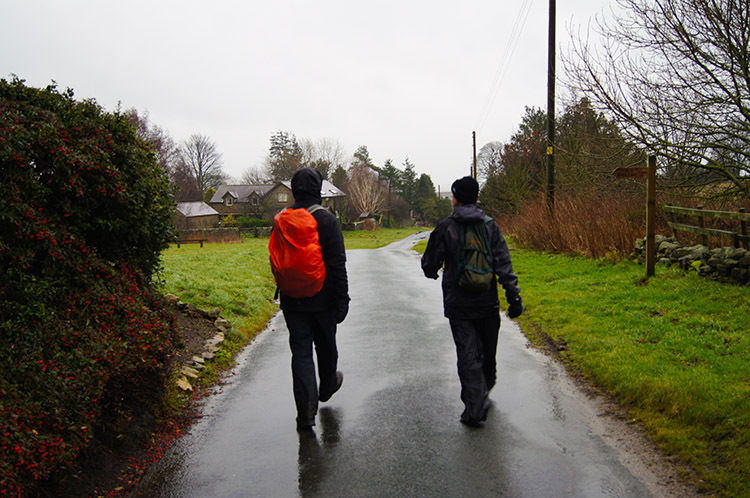 After arriving from separate directions, John from the east and Dave and I from the south we donned our wet weather gear and set off by walking south along a lane out of the village towards Low Thorpe. Then it was south and east to Waterloo Farm which we had no battle reaching. After Waterloo though the uphill gradient increased and we were into the only significant climb of the walk to Hammer Farm and beyond by way of a discretionary diversion which bypassed the farmyard towards Grey Yaud Plantation which we entered to the sound of gunfire. We climbed steeply through the plantation and levelled out at the top having climbed 150 metres in just short of two miles. It was time for a five minute breather but as the rain continued to fall we did not dwell, stopping walking led to rapid cooling which we did not want. 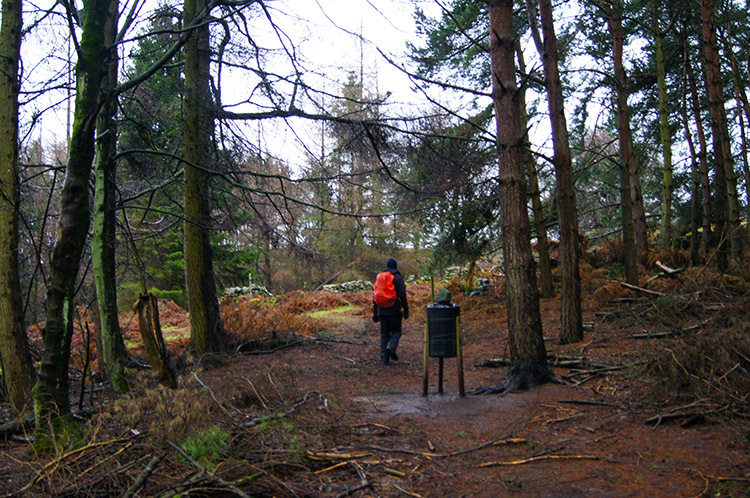 On leaving Grey Yaud Plantation we came to two people walking from the upland plateau into the wood. They were beaters and told us they would soon be driving the Pheasants we saw in the wood out into the open so the gunmen we had heard could continue to enjoy their sport. I don't think Pheasants are much of a challenge though. 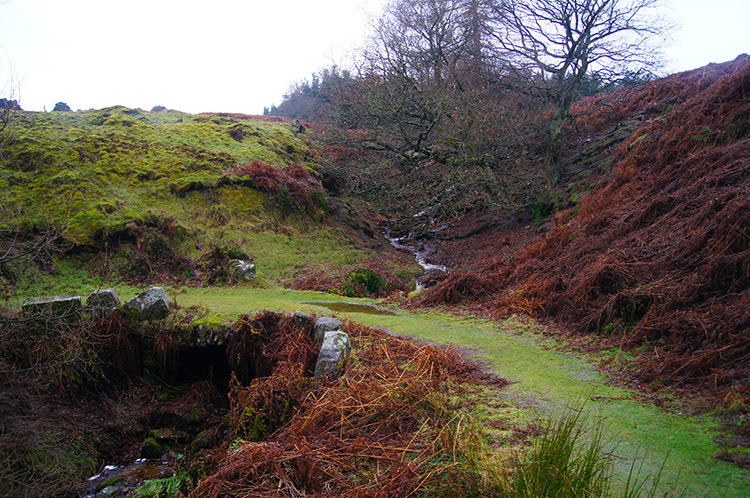 Anyway, I soon dismissed that thought as we came to a gem of a switchback path over a spring between Grey Yaud and Moor Cote. 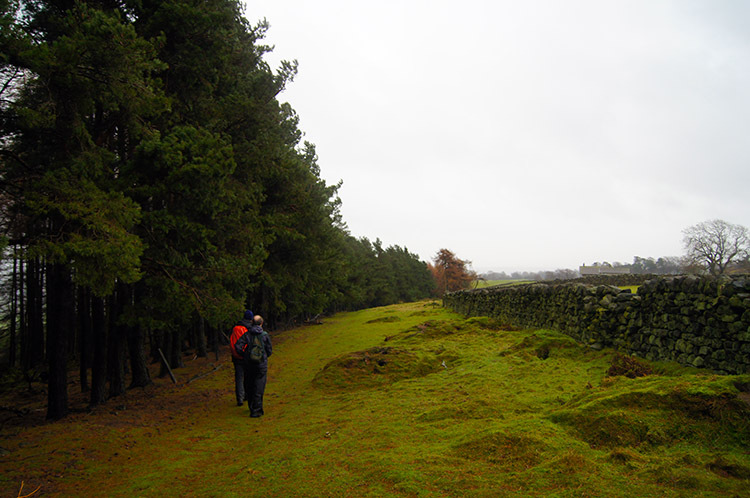 A small climb from the spring to another plantation near Moor Cote and we were on the high point of the walk. Apart from a few undulations the climbing was done and we could enjoy a stroll in Wensleydale. The rain continued to fall but as we reached Ellingstring it moderated to a drizzle and we hoped for better soon. One lady was collecting logs from a hut outside the first house in the village as we walked through; otherwise it was quiet. No one else stirred. The stretch of walking we did from Ellingstring to Quarry Hill was the worse of the walk, it being a struggle on a badly eroded farm track with deep puddles we had to wade through, even by grabbing hold of the hedgerow along the lane and trying to stay high. And then the track through the dell south of Quarry Hill was claggy too but don't despair as I have drawn the route up using the alternative lane which avoids this stretch of bad walking and eyesore. Farmer, please do better. On the north side of Quarry Hill conditions improved greatly and we were rewarded with lovely views to Wensleydale as we began our descent to High Jervaulx across good grassed fields. 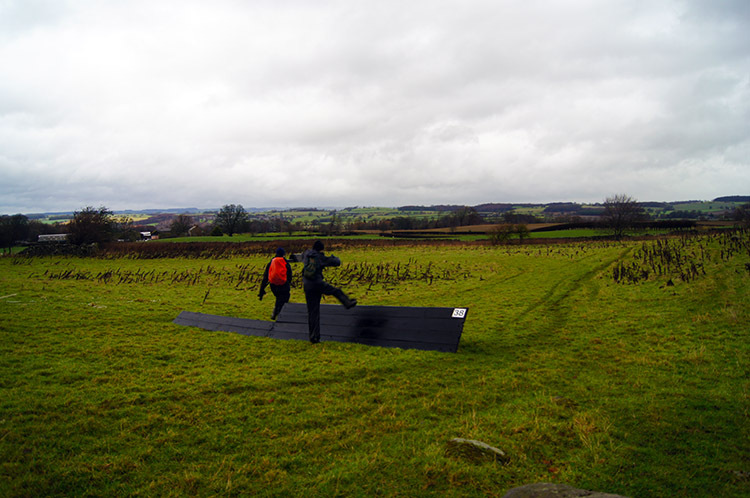 Dave and John had some fun as we walked across the fields near High Jervaulx towards North Wood and Masham Bank. We were walking across an equestrian cross country course and the boys in holiday vigour decided to leap one of the obstacles. No faults were incurred as the cleared the chosen hurdle though Dave accumulated bonus points by leaping the higher right hand side of the hurdle. After the cross country course we had more fun while walking across a wide fiend with a high hedge in the middle. The hedge had gaps in many places and as we approached each gap groups of sheep raced through to join the growing flock on the field side we were in. Why they chose to run just as we neared was clear as the had noticed the previous sheep activity but a bit barmpot as they could have waited until we had passed and then strolled through at their leisure. 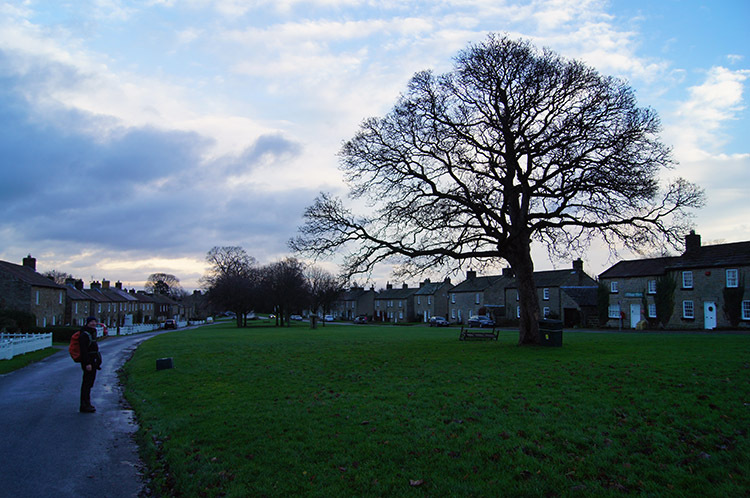 After reaching North Wood we crossed over the A6108 Masham to Leyburn Road and walked over a field with a series of Drumlins to Ramshaw where behold it stopped raining and the sun came out almost immediately afterwards. It was the sign to stop for lunch and as it was Christmas time John handed me one of Joanne's lovely cookies while I reciprocated the offer of a gift by handing him a piece of pork pie. We were both happy with the trade. The lunch spot we found was good too, a shaded copse by a small babbling brook. Out of the wind and with sun on our faces it was as good a late December picnic spot as any to find. 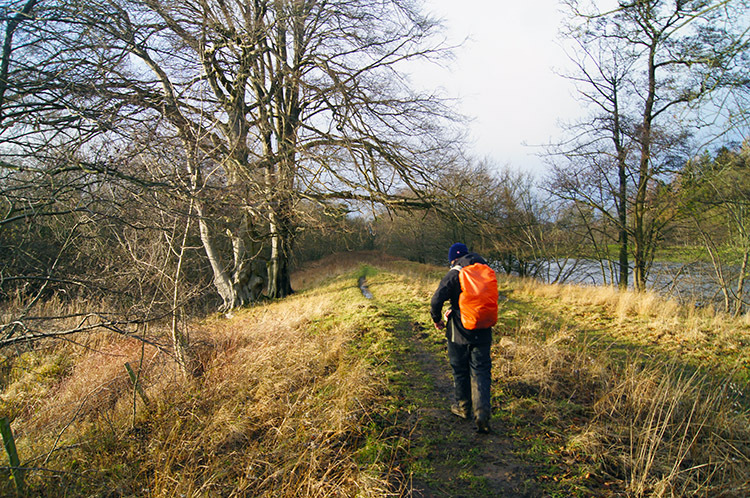 After the break we crossed another field to Kilgram Lane from where we turned from a north to west course. After 100 metres of road we came to a lodge which marked our entry into Jervaulx Park. We were now on the final stretch to the abbey. 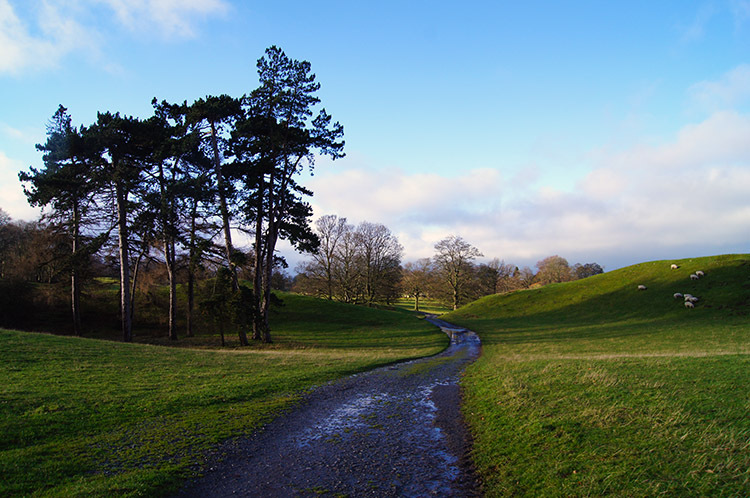 It was delightful walking through Jervaulx Park. Raised banked fields were either side of us and there were nicely manicured small copses at random. Halfway along the road into the park we passed a substantial pond which no doubt was fished by the monks when Jervaulx was a working abbey. Of course grumpy Henry VIII put an end to that and thankfully the sacking of the abbey was not quite a complete job as it left us with the haunting ruins of the place. I had finally arrived at Jervaulx Abbey. I was fascinated as I walked around the grounds of Jervaulx Abbey, I always am by such places as I try to imagine the lifestyle of the monks and the harsh conditions of life. Still it was probably tougher for the lay people outside the protection of the abbey though. 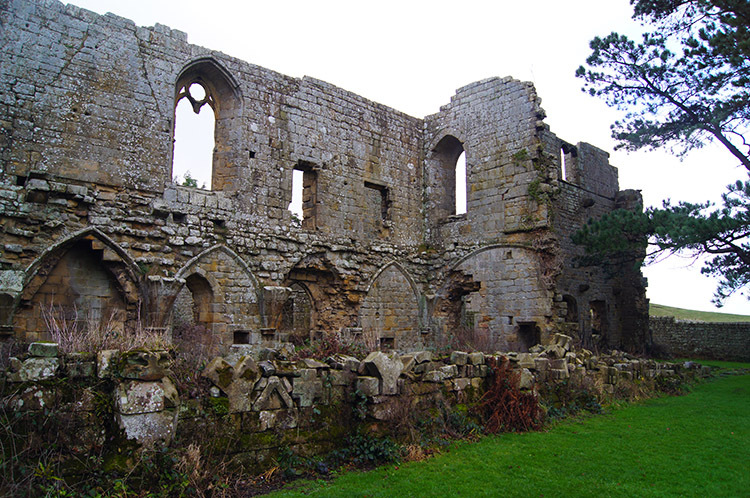 Jervaulx was one of the great Cistercian abbeys of Yorkshire. It was a working abbey for around 400 years until it was dissolved in 1537, and its last abbot Adam Sedbar was hanged. 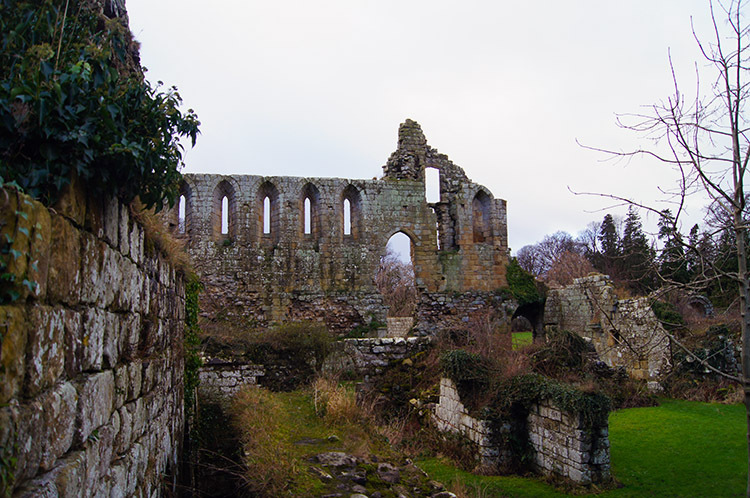 The ruins of the abbey are open to the public and are privately owned and so when I left I made the requested donation in the donation box at the abbey entrance. 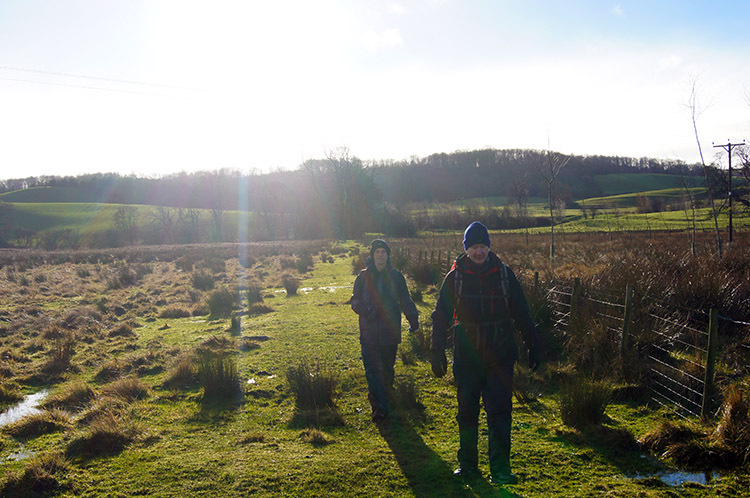 From the abbey Dave, John and I walked alongside the main road for a hundred yards 300 yards before leaving it to follow a footpath parallel to Harker Beck which drew us to the bank of the River Ure. 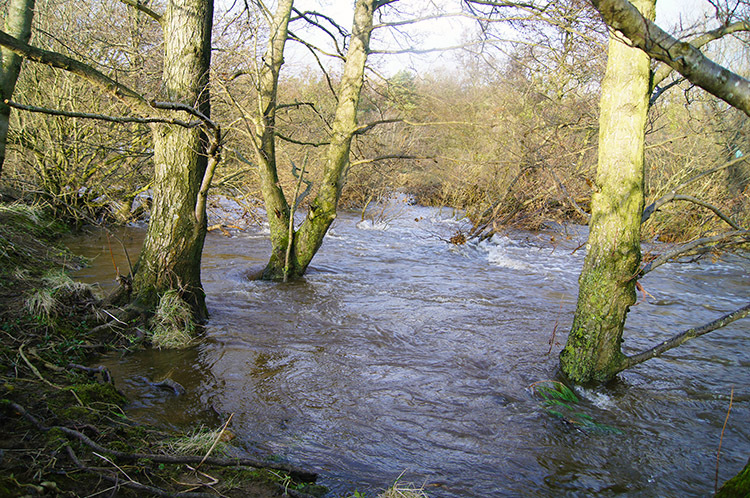 The river was full to breaking point, this winter was a wet one and we had heavy rain in the Christmas week. We walked upstream following the river towards Fish Pond Plantation. 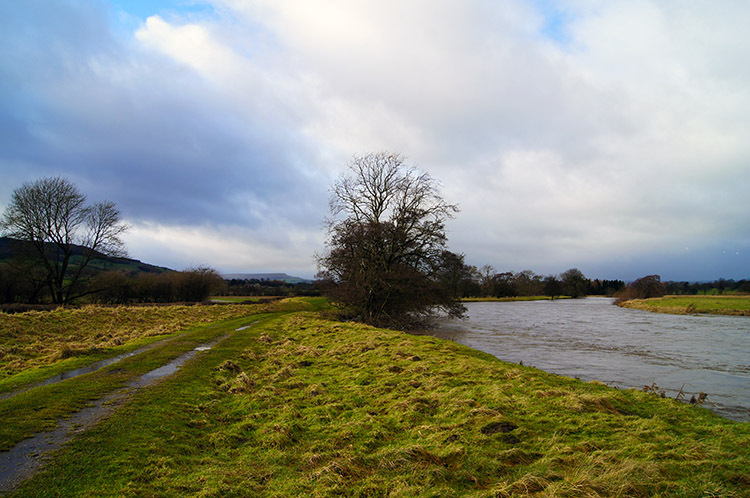 The rain was now a fading memory but the benign conditions it fell under had been replaced by a stiffening wind and we struggled to walk on the upstream course against the wind. On a couple of occasions the wind blew strong enough to stop us in our tracks and even blow us back. 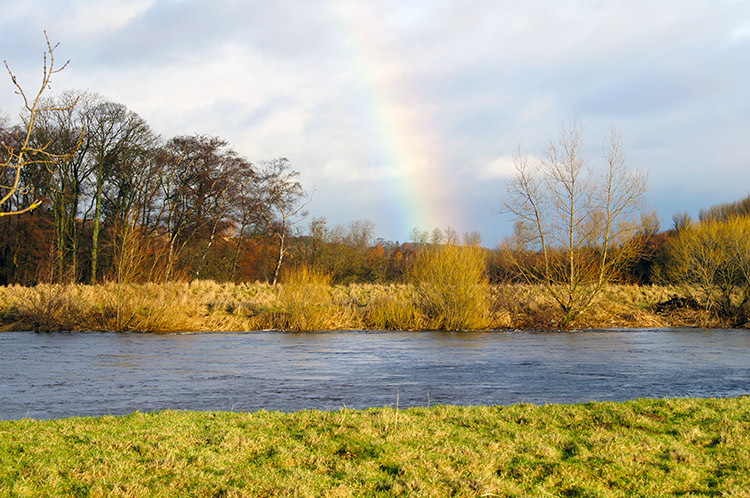 It was the brightest part of the day though and the views of both the river and west to Penhill were clear ones. The walk along the river to Cover Bridge was a long one and I admit I was getting a little tired. So too was Dave who lagged a little behind, probably out of choice as he meandered more than the river which was in a full rage. Riverside banks of trees which usually stood high and dry on the river bank were submerged and having to hold tight against the strong current. 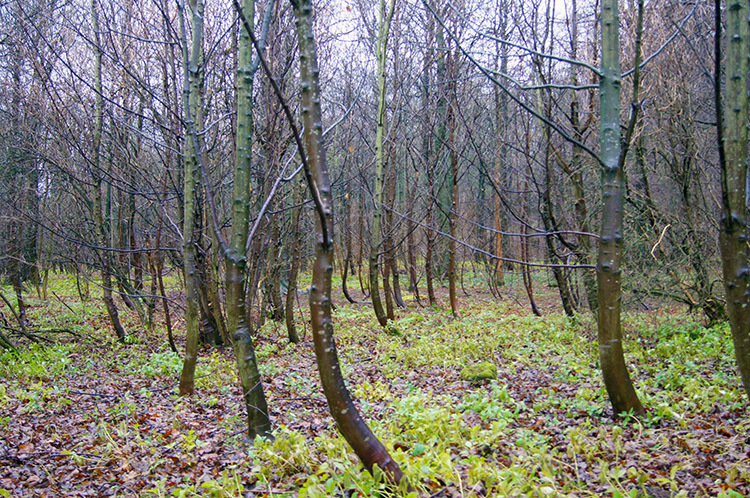 I imagine some of the smaller and younger saplings will not have survived the onslaught. We walked just over a mile and a half along the river until we reached Cover Bridge. We checked out the inn; it was open so we stepped in for a refreshing pint. 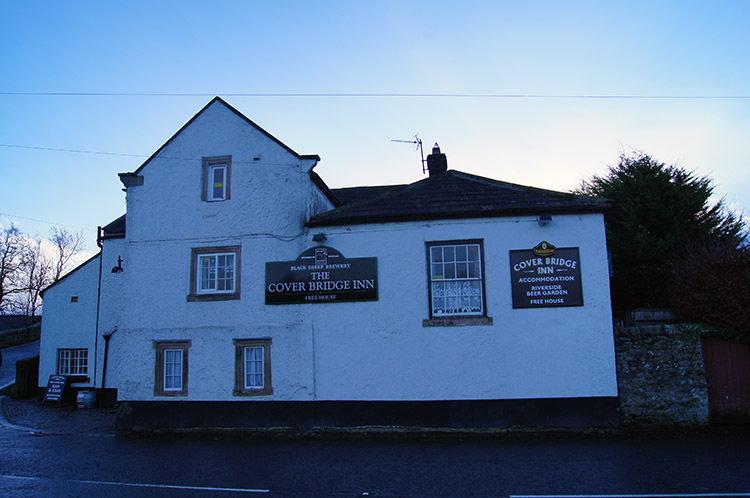 The Cover Bridge Inn is a walkers paradise, old fashioned retaining a quaint charm. The landlady was amiable and helpful, the beer was perfectly presented and very refreshing. Had we not a walk to complete and cars to drive home we could have easily stayed in the relaxing atmosphere of the bar. After the reluctant steps we made out of the Cover Bridge Inn we crossed the bridge and followed a footpath sign which led us back to East Witton over a series of small fields. 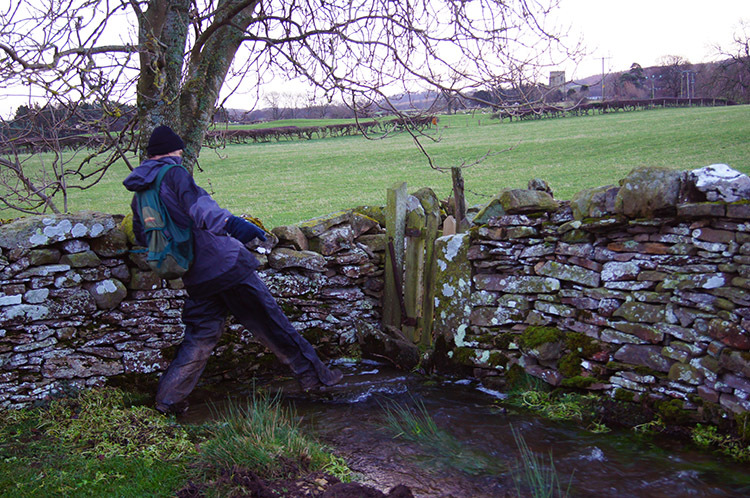 Some narrow gates between the fields had tiny streams running alongside them though some were a little challenging to get through without getting feet wet. 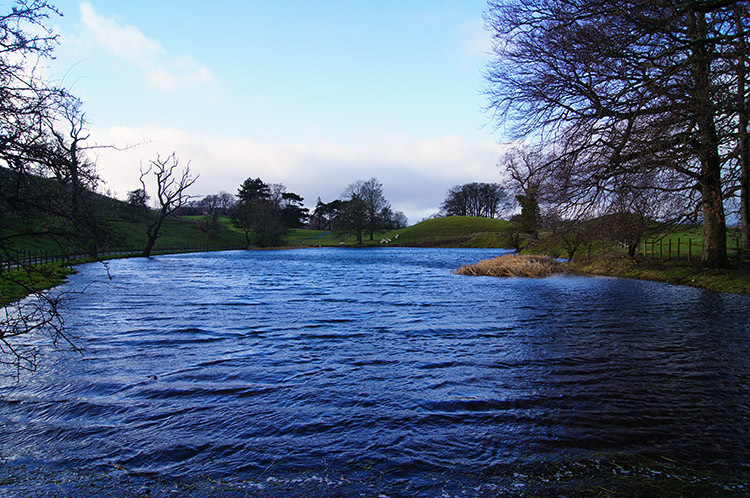 They were flowing as heavily as they probably can without bursting to create temporary ponds in the open fields. After some nifty strategies we made our way through and across the watery hurdles and stepped up the final field back into the village. It was starting to get dark as we arrived back, we were just one week beyond the shortest day. It was a good invigorating walk we had just completed with the highlights being the abbey and riverside ramble. And now we were sufficiently ready to face New Year's Eve.